Security is our first priority. We at senangPay always review and improve our security features to make sure that we are free and safe from digital threats such as hackers, scammers, and even malware such as trojan. We make sure your transaction is secured so that you and your customer will experience a free of mind. One of the basic precautions is that senangPay is registered with GeoTrust. 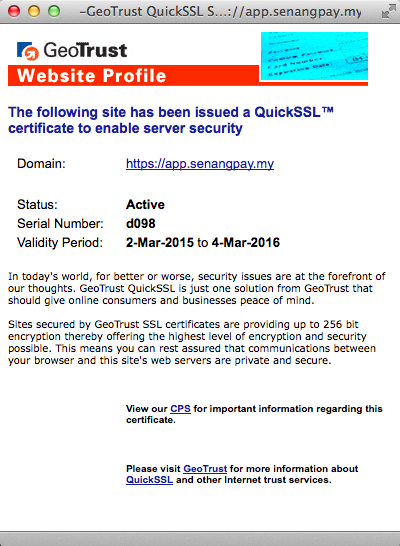 GeoTrust® is the world’s second largest digital certificate provider. More than 100,000 customers in over 150 countries trust GeoTrust to secure online transactions and conduct business over the Internet. Their range of digital certificates and trust products enable organizations of all sizes to maximize the security of their digital transactions cost-effectively. The GeoTrust brand is now owned by Symantec as part of its $1.28 billion acquisition of Verisign’s security business in 2010 (Wikipedia). GeoTrust’s Signing Products represent the latest in next-generation technology for digitally signing applications, binding people and documents, and assuring code integrity to wireless platforms. The GeoTrust® GeoCenter, a robust management portal, offers 24/7 control, instant issuance, and volume pricing for GeoTrust Partners and Enterprise SSL customers. For more info on GeoTrust, click here. There are a few places where you can see that senangPay is already registered with GeoTrust. First, on the login page to the Dashboard. You should see a small banner under the login form. 1. Click on the GeoTrust banner to view the details. 2. A pop up window will appear that shows the status of the SSL certificate. 3. Next, you can also refer to the URL menu of senangPay, on top of your browser. 4. 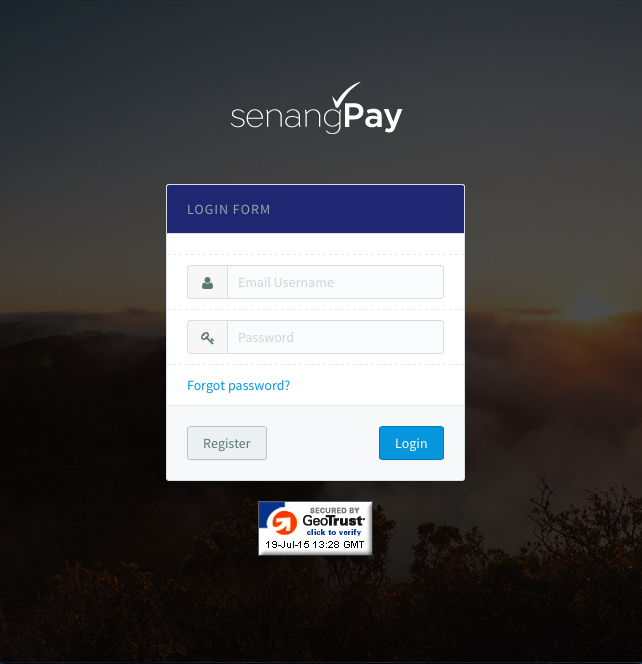 Click on the https icon between the senangPay logo and senangPay web address. 5. A drop down message box will appear to inform you that your computer is connected to senangPay with encrypted connection. 6. Click on the Show Certificate to view the details. 7. 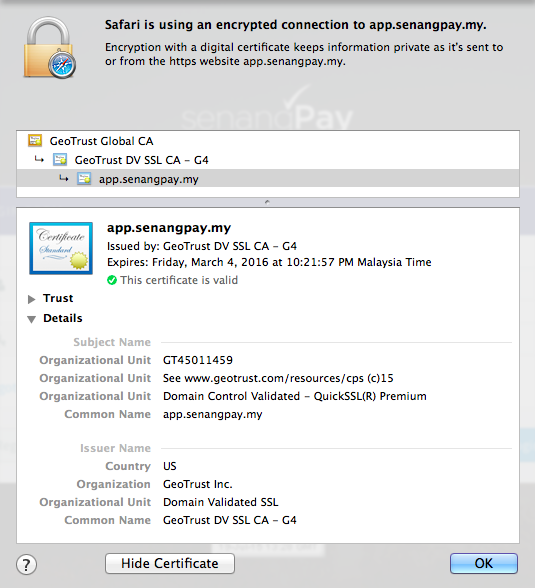 Last, you can also view the same GeoTrust certificate as mentioned above on the Payment Form. 1. senangPay is safe & secured. 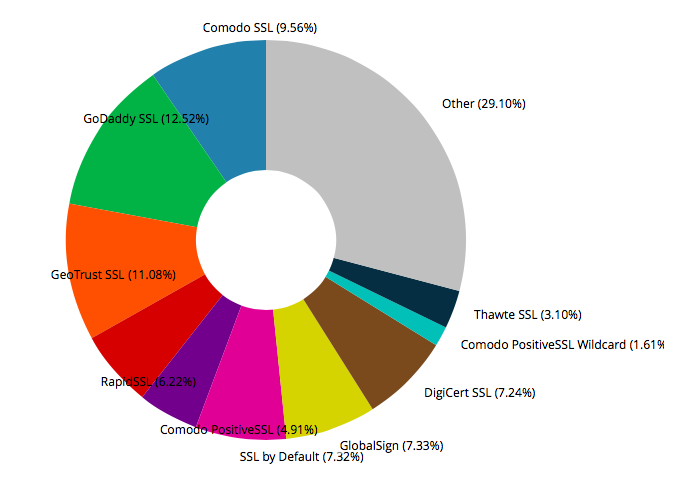 2. senangPay use world class SSL security.